Nancy Travis is a renowned American actress and producer. She is widely recognized for her movies like Internal Affairs, Three Men and a Baby, So I Married an Axe Murderer, Greedy and much more. Talking about her personal life, she is living a blissful life with her husband and two children. Nancy Ann Travis Nancy was born on September 21, 1961, to Theresa and Gordon Travis in New York City, U.S. Spending most of her childhood in Boston, Massachusetts, and Baltimore, Maryland, she got involved in the theatre since her early age. Nancy attended Framingham North High School and graduated from there in 1979. Moreover, she went to attend drama at New York University. After her graduation, Nancy worked in the play "It’s Hard to be a Jew." Then, she began to appear in a stage version of Neil Simon’s ‘Brighton Beach Memoirs.' Later, she became a founding part of the Off-Broadway theater company Naked Angels. She began to appear in their production of Frank Pugliese's play "Aven-U Boys, " as well as "King of Connecticut" with Frances McDormand. Additionally, she also played in the Broadway run of the award-winning play "I'm Not Rappaport" and Athol Fugard's "My Children, My Africa." Nancy Travis's breakthrough role arrived when she played the lead role as Prof. Joyce Reardon in the television series "Stephen King's Rose Red" in 2002. Some of her notable movies and television series are Almost Perfect (1995 – 1997), Duckman (1994 – 1997), Last Man Standing (2011 – 2017), Three Men and a Baby (1987), Three Men and a Little Lady (1990), So I Married an Axe Murderer (1993), Greedy (1994), Dissonance (2014) and much more. 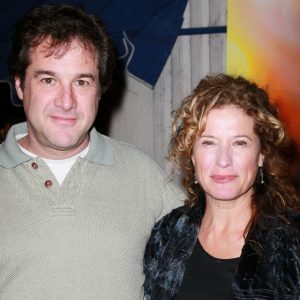 The 56 years old, Nancy Travis is a married woman. She and her husband Robert N. Fried have been married for 23 years. Their wedding was in 1994 in a private ceremony where only close friends and relatives attended the wedding. 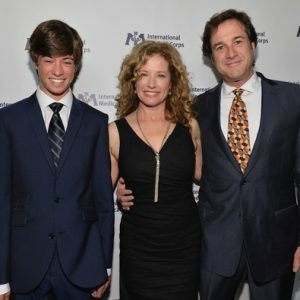 Her husband, Robert is an American Film/TV Producer, who is also the retired president and CEO of Savoy Pictures. Robert N. Fried is currently Founder & CEO of Feeln. They have two sons named Benjamin born in 1998, and Jeremy born in 2001. As of now their 23 years marriage relations is going very well, and there are no signs of their separation. Having active in this industry since 1985, Nancy Travis has appeared several films and tv series. With her incredible acting skill, she earned the Prism Award in 2008, and her current estimated net worth has $ 2 million.